Hot today, didn't get the chance to go out and swim, to busy chasing bees out of the house. For some reason they've found a way to get in, just one at time they'll come in, we open the door and they fly out. It's kind of a game now. The black ones, but they don't ever hurt me, so I'm good with it. Just wish I could figure out where they're getting in. I'm tempted to turn on the AC right now, but hey, it's evening, not sure if I should..maybe I will, our Grandpuppy's here, and he's panting, so just for him, maybe I will. Oh, our McDonald's Fundraiser got around $400 so we did really well (just think, that was 20% of what they took in, so that was excellent, we had a lot of people come in and buying stuff to support us. How wonderful. Have a great evening, a wonderful Friday, and fantastic weekend. Oh, this is our Daughter and Son-In-Law's (and his family's) pulling truck during a pull a couple times back. The engine had problems, as you can see..but the picture is so cool. 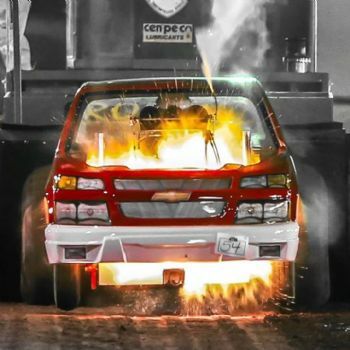 The truck is called the "Dirt Flirt", and this last pull (not the one this photo was taken) they got 4th place out of 18 trucks. YAY! I don't crowds either. What a cool picture! That should be submitted somewhere! i'm with you.... .i don't do crowds! Enjoy your time with just the grandpup for company. Sometimes that is the most relaxing time of all.